Custom software development suggests the creation of custom tools and programs to help improve the efficiency of your business. By investing in these programs, you will reduce the manual workload of your employees, thus making your work processes more efficient. When you use Netgen, you will be offered, expert advice, affordable prices and no licensing fees – which means that the software developed by Netgen, will become your property. Netgen has remained consistent in their quality of service and delivery since opening their doors in 2000. With a steadfast dedication to maintaining long-lasting relationships with loyal clients, they are the team of IT professionals to hire in South Africa. What makes them a leader in their industry is their commitment to delivering solutions on time, after-sales support and the fact that they have multiple offices throughout the country. 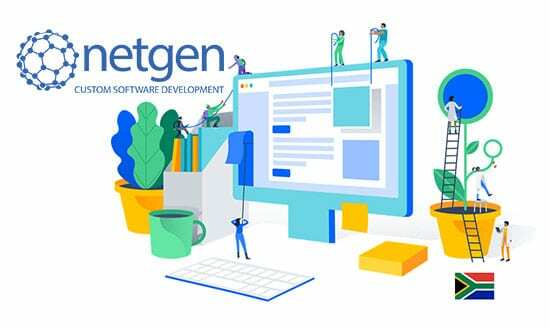 Every client that has ever dealt with Netgen is more than happy to recommend them as the software development company of choice in Cape Town and Johannesburg. With its world-class project managers and developers, this highly capable team can produce efficient web-based solutions at an affordable price. Their services include custom website design, bespoke application development and software development. With their extensive experience, they take a highly innovative approach to successfully execute every project. At Netgen, there are no half measures when it comes to software development or any other service for that matter. They are as reliable and trustworthy as they were 18 years ago. As your business grows and your requirements change, Netgen will be there to help you transition seamlessly. You can rely on the same support enjoyed by their clients over the years. There’s no need to look for a software developer outside the borders of South Africa when you have experts like Netgen at your disposal. Get in touch with the team for a free quote today! Previous PostGet the most out of your website with an integrated website marketing strategy! Next PostBank on 4 essential web solutions under one roof at Netgen.